It is release day @ Taylored Expressions! Hello and welcome back. 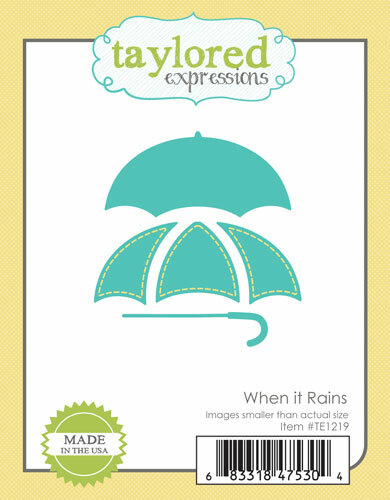 Very excited to say it’s the release day at Taylored Expressions store. All the February release products I have been sharing with you over the past three days are available for purchase at the store today at 9.00am. Today I am again sharing with you couple of new projects using the new goodies. 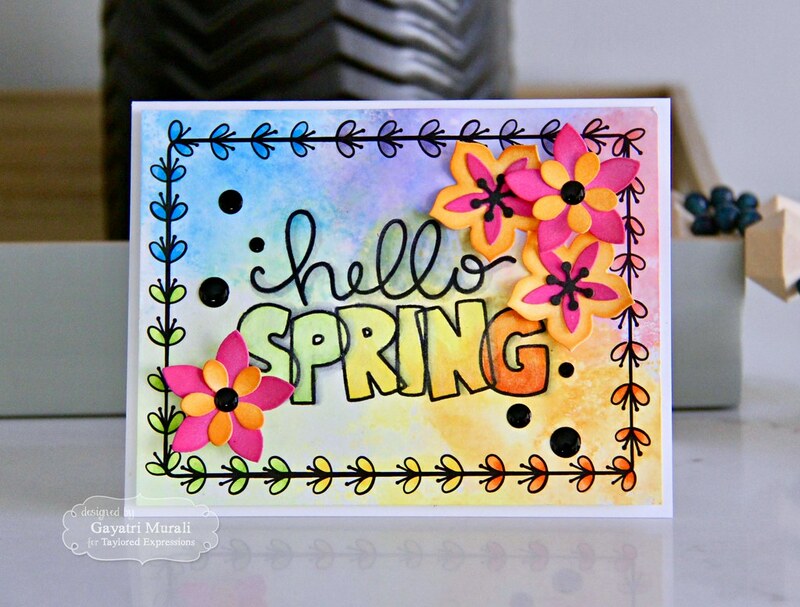 This first one is using the new Bubble Greeting Spring stamp set and Boxed In Basics 2. 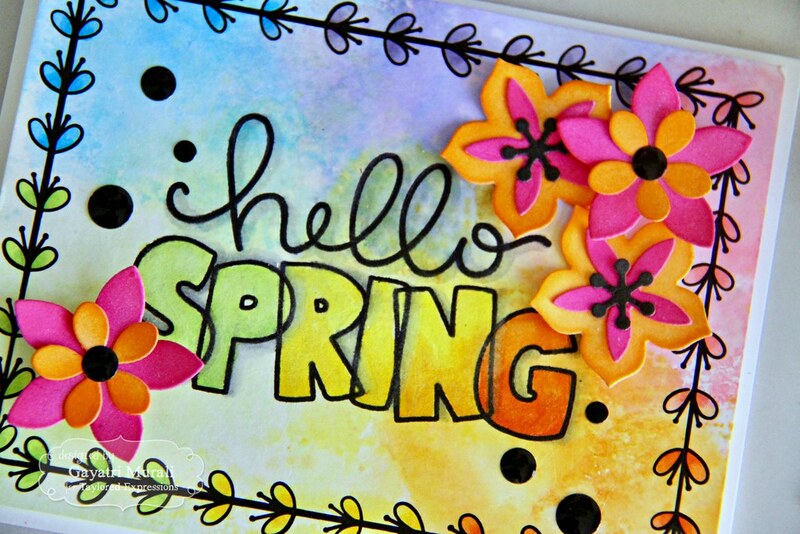 The boxed in basics are printed panel into which the sentiments from Bubble Greeting Spring fits in perfectly. Card base is Sugar Cube TE cardstock. I smooshed distress inks in rainbow colours to add colours and interest. I dried each layer before smooshing again. I think I repeated the process thrice. Once dry, I used to MISTI to stamp the sentiment using Oreo ink. 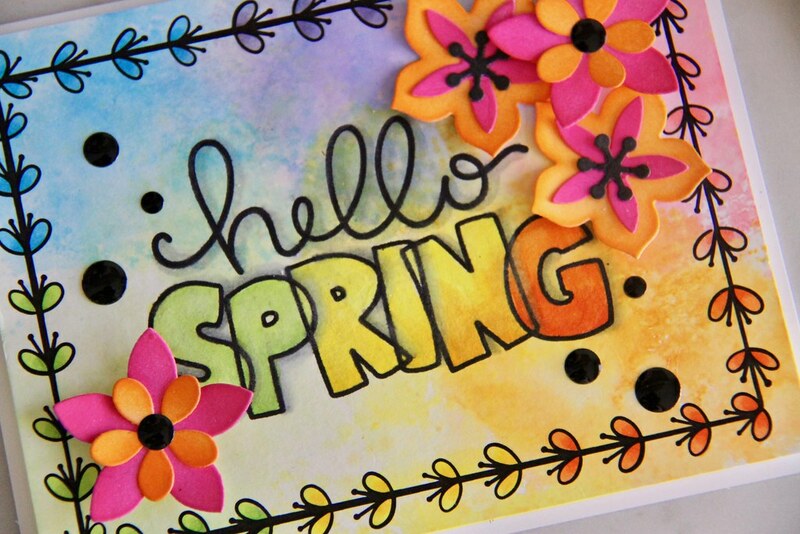 Then to add shading, I used copic markers in the same colours but darker shades to coloured the open sentiment “Spring”. I also did the same to the border leaves. Then I added some shadow effect to the sentiment using gray copic markers. To add more colours, I die cut the flowers from older die set called Bloomers. I used Bloomers 5 and 6 to die cut using Sugar Cube cardstock and sponged distress ink in Picked Raspberry, Spiced Marmalade and Black Soot. I then layered and glued the flowers, added dimension by curling the petals and adhered as shown. I used Oreo enamel shapes to add flower centre and accents on the panel. The completed panel is adhered on the Sugar Cube card base. Here are some closeup photos. I love the rainbow colours on the card. 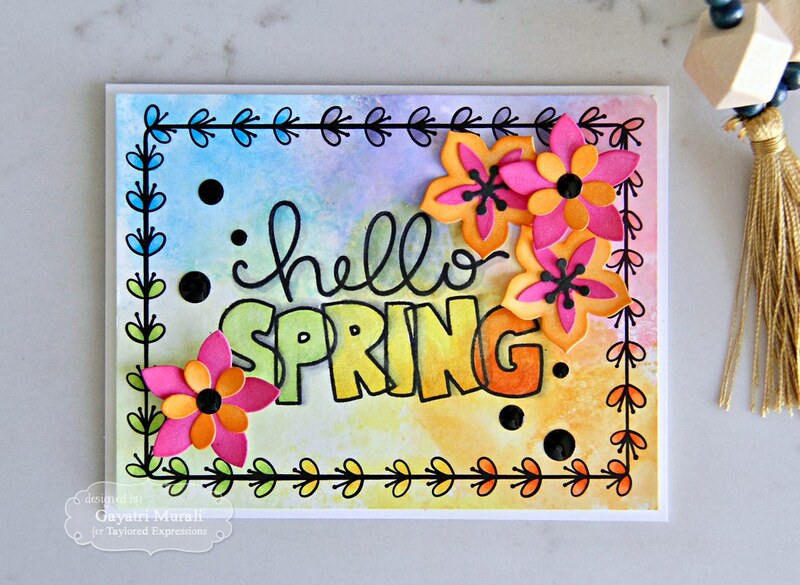 Such an easy and simple card to make but the colours pack a punch. 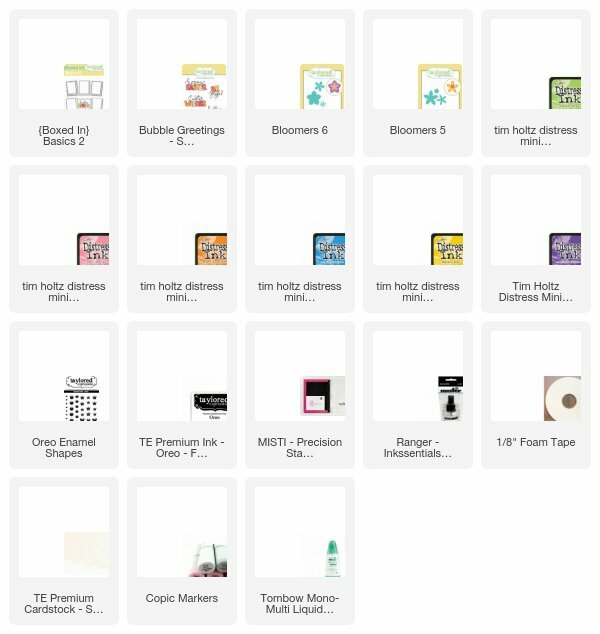 All the supplies using to make this card are listed below. The second project features When it Rains die. 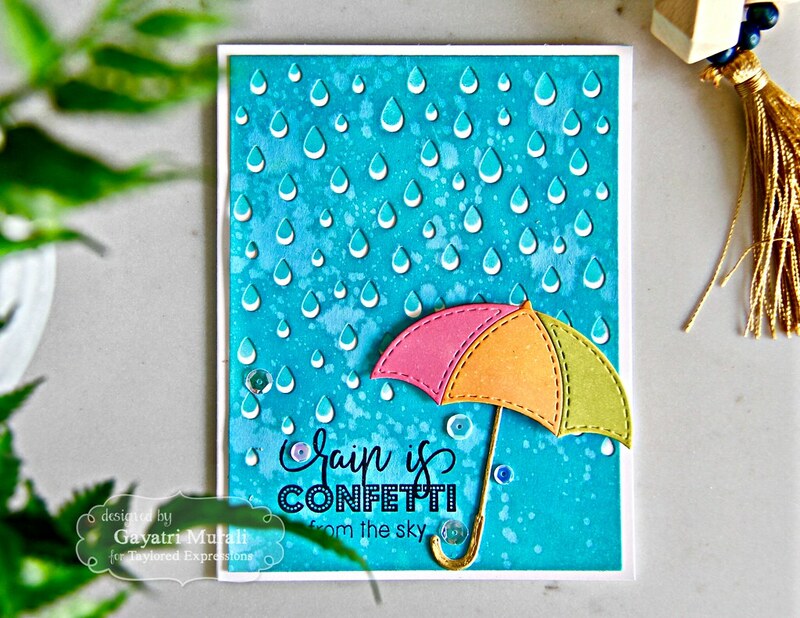 I have combined with two new products called Falling Rain Cutting Plate and Rain or Shine stamp set. This is a very straight forward card. Again the colours packs a punch to the card. I trimmed another Sugar Cube panel to 4″x 5.25″ , die cut the panel using Falling Rain cutting plate and used it as stencil to sponged Peacock Feathers distress oxide ink on the card front. I also sponged the same distress ink heavily on the die cut panel as well. Then I spattered clean clear water liberally and left the panel to dry. I die cut the umbrella pieces from When It Rains die using Sugar Cube cardstock and sponged them with Picked Raspberry, Wild Honey and Twisted Citron distress oxide inks. 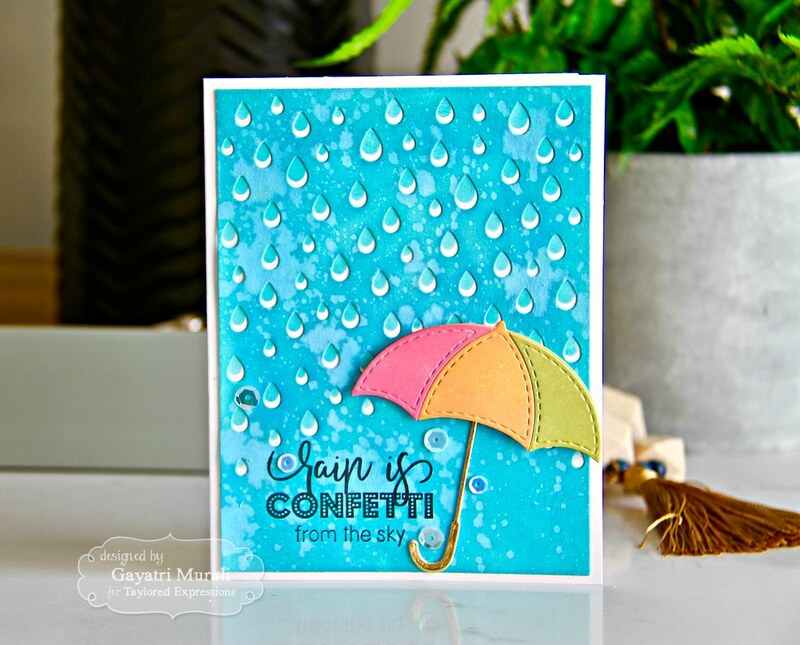 The handle of the umbrella is die cut using TE gold foil cardstock. I assembled the umbrella and adhered on the bottom left of the falling rain panel. 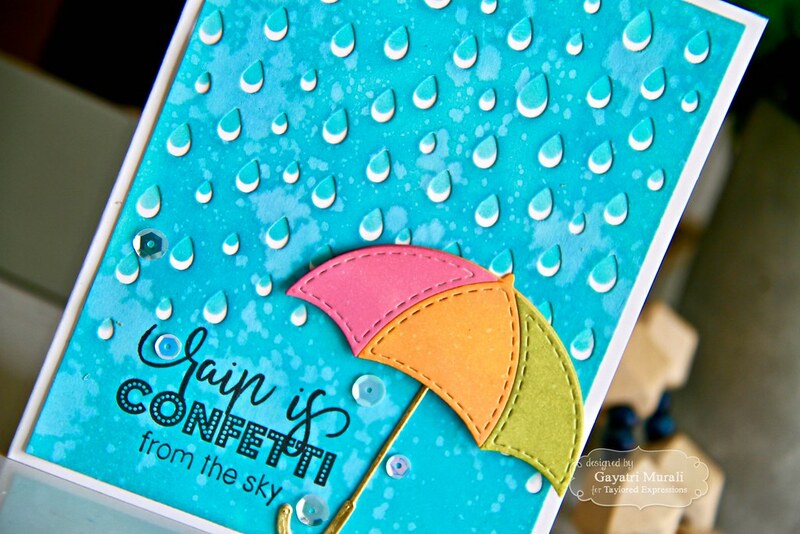 Using MISTI I double stamped the sentiment from Rain or Shine stamp set using Oreo hybrid ink to get even coverage. 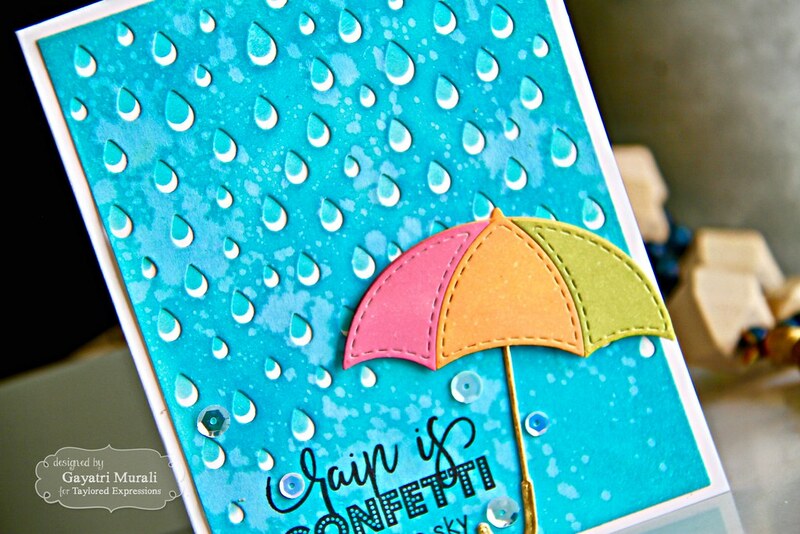 I adhered the completed panel on the card front slightly offsetting the sponged rain on the card front. Offsetting the panel gives a little peek of white on the bottom of each rain drop. I love that effect. Finally I embellished the card front using TE sequins. Hope you like all my projects for this release. 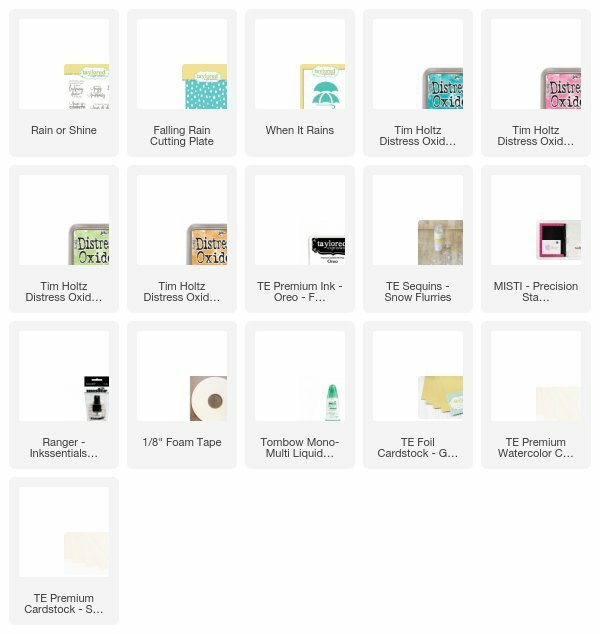 Check out TE blog for more design team sneak peeks and leave them some love. Happy Shopping!